Hamilton Blues Lovers: CONGRATS! Erin McCallum Receives 1st BluesSource/Blues Blast Album of the Year Award! CONGRATS! 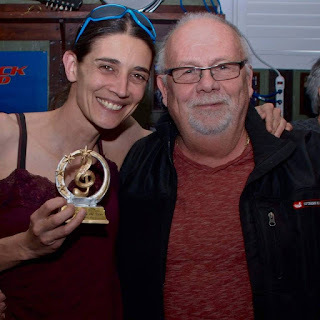 Erin McCallum Receives 1st BluesSource/Blues Blast Album of the Year Award! It's Time, the latest recording from Toronto area Blueswoman, Erin McCallum has received the very first award from Hamilton's BluesSource/BluesBlast (Album of the Year - 2015). The talented lady recently gave explosive performance at Jet Hall (Hamilton) and the Golden Pheasant (St. Catharines). It was at the latter show that Blues Blast host (and BluesSource head honcho) Ken Wallis handed her the well-deserved trophy himself!. "Erin McCallum’s voice could fill Rome’s Coliseum, " Ken remarked. Hamilton Bluesmaster Jack de Keyzer produced the amazing CD!